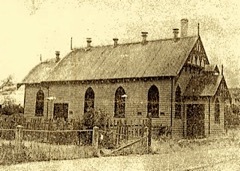 While early Anglican families gathered for worship at odd times from 1917, regular services began on the first Sunday in August in 1946 and were held in the Torquay Public Hall. The Ladies' Guild was formed on the 14th of August in the same year. 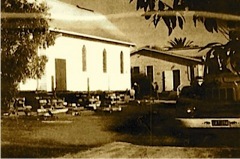 The St Luke's Church building was transported from Fyansford in March 1947, and dedicated by the Archdeacon of Geelong, Bishop Donald Baker on the 15th of May 1947. The Sunday School opened on the 1st of June 1947 with Miss Joyce Smith (later Mrs Joyce Hunt) as Superintendent. One of the outposts of St Paul's Anglican Parish, Geelong, for many years, St Luke's Church building at Fyansford is to be transferred to Torquay, where it will serve the requirements of the Anglican parishioners at that centre until the Torquay Church of England authorities can secure permission to erect their own church building. When the building is removed parishioners who previously worshipped at Fyansford will be provided for at St. Paul's Church and at St John's Church, Geelong West. The building will be a great asset to the Torquay congregation. In the past the services there, in the absence of a church building, have been held in the Torquay Public Hall. The photograph shows the building before the commencement of the dismantling work necessary for the transfer. 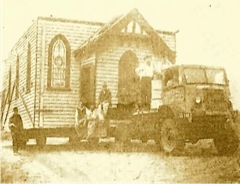 The building of St Luke's Church of England, Fyansford being transported to Torquay, where it is to be re-erected on a site acquired for the purpose. The Reverend James Waterman was appointed the first Vicar in 1950 of the Parish of Mt. Duneed with Torquay, Freshwater Creek and Anglesea. However it was not long until the vicarage was located to Munday Street, Torquay. The years passed, Vicars came and went and the congregations grew steadily. Visitors boosted the attendances at Christmas and Easter. In July 1993 the Vicarage in Munday Street was sold. St Luke's building was moved and was linked to the Parish Hall by constructing a Narthex, with the entrance on Price Street. A church office was also included within the complex. These works created a Worship and Community Centre more suitable for the needs of the parish. A new Vicarage was constructed on the site where the Church had stood for over forty years. In 1987 the name of the Parish changed to St Luke's Torquay with Anglesea and Mt. Duneed. A parish choir was also formed in 1986. In 1994 on the formation of the Anglican Surfcoast Parish, the composition of the parish changed again. Freshwater Creek had ceased, Mt. Duneed joined with Grovedale while Aireys Inlet and Lorne became part of the four centre parish. In 2012 the Anglican and Uniting Church congregations in Lorne united to form an independent parish. The Surfcoast Anglican Parish now consists of three parish centres at Torquay, Anglesea and Aireys Inlet.